I read a long time ago on one of those "frugal" sites that give tips on being frugal, that people re-used cereal bags for things that they used wax paper for. So, I started to think, if I could use it the same way I use wax paper. . . couldn't I use it for crafts? 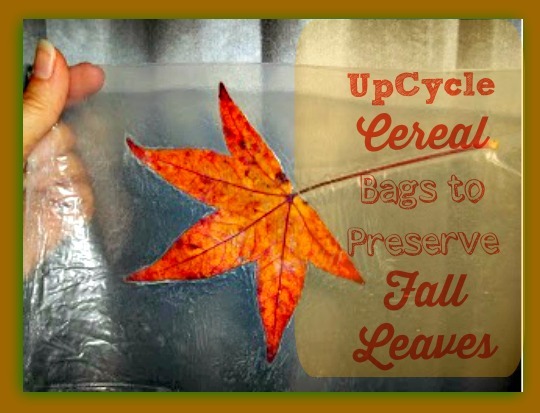 I decided to melt the cereal bag together to encase a fall leaf. This should ONLY be done by an adult. Heat iron to low. Take clean cereal bag apart so that it's one long sheet. Fold cereal bag sheet in half and place a fall leaf between the fold. Place a sheet of newspaper beneath the cereal bag and another sheet of newspaper on top of cereal bag. Place iron on top of newspaper and hold it there for about 10 seconds and move to another spot. Continue until you've covered the entire area. Check to see if the cereal bag has melted. If it's not melted together yet, reheat and check again. Please be careful not to burn anything! I made a frame for our leaf from a painted pasta box. I cut out a larger window. Then I painted the box grey and placed the leaf inside. I will glue it to the cardboard around the "window". I was thinking about painting the inside of the box blue like the sky. And it would be cute too if you put a little electric votive in there to light the leaf from behind. As you can tell by the picture above, I have not glued mine in yet or painted the inside of the box blue. Just thought I'd share before all of the leaves start turning brown and becoming leaf piles! What leaf crafts are you doing? I know my kids are ready to have them in a big pile to jump in! Guess if it ever stops raining, they'll have to start raking!